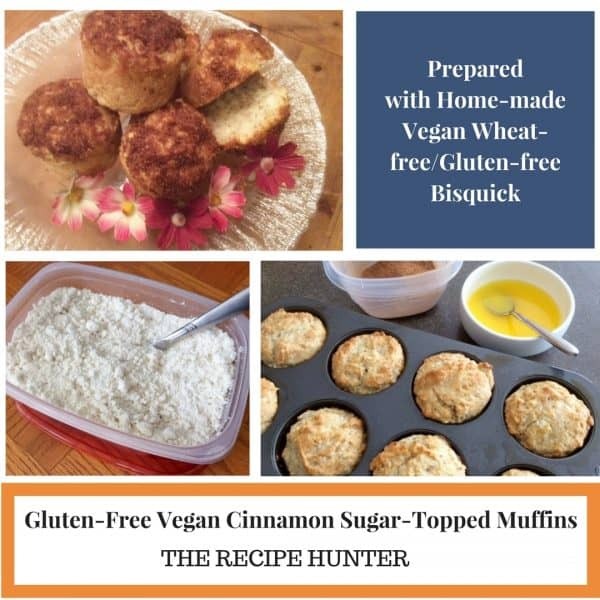 Keep some Home-made Vegan Gluten-free Bisquick in the fridge, then you can bake these Gluten-Free Vegan Cinnamon Sugar-Topped Muffins in record time. **To make a flax egg, mix 1 tsp. ground flaxseed meal with 3 tsp. of water. Mix together, and let sit in your fridge for ±15 minutes to set and thicken up. Mix the Vegan Gluten-free Bisquick, sugar, milk, flax-egg, and oil until combined. Divide mixture into an 8-well extra large cupcake tray. Bake for ±25-30 minutes until golden brown or a skewer inserted in the center comes out clean. After muffins have cooled off, dip the top in melted butter, then dunk in the cinnamon sugar mixture to coat the tops. Let it cool down properly, and munch into a very flavorsome, light and wonderful muffin. You can also bake it in a bread pan or regular muffin pan, although I prefer to use the large cupcake pan as it’s a good size serving. These look yummy, and healthy too. I have the same problem with spammed comments and must remember to check my spam every now and then. I usually check daily but this one must have slipped. Sorry about that.